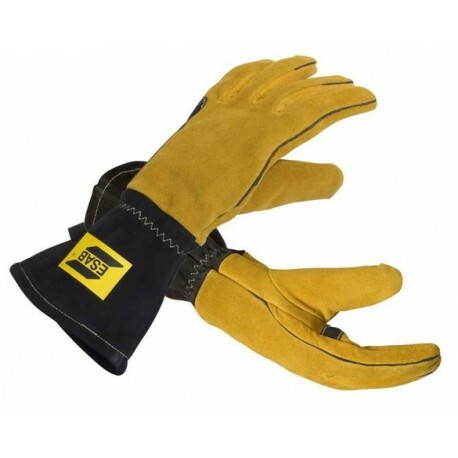 These superior new welding gloves from ESAB offer a whole new approach to fit, form and function. Ergonomically designed to fit the natural curve of the hand, offering increased quality & comfort to the wearer. The MIG glove is made from heavy & fine cut leather, and is lined from hand to cuff. With the curved design the glove fits the hand perfectly, and also has a flexible wrist area which reduces friction. With welted seams, kevlar stitching & reinforced thumb, the glove is very strong and offers a very high level of protection to the wearer. EN 12477 and EN 388 Cat 2.